Fig. 1. Schematic of the active MASW field survey. Fig. 2. 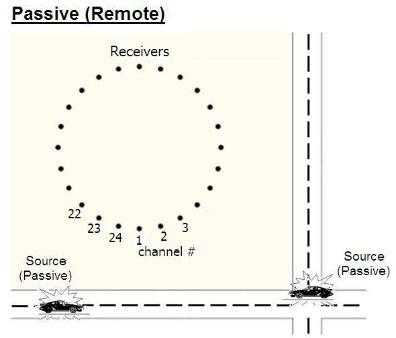 Schematic of the passive remote MASW field survey. Fig. 3. Schematic of the passive roadside MASW field survey. such as traffic and tidal motion. (e.g., 1-20 m) and deep (e.g., 20-100 m) Vs information simultaneously.